Residents of Nassau and Suffolk counties typically enjoy superior quality water and a plentiful supply. Meticulously managed and highly regulated, both counties draw drinking water from a sole source, a system of aquifers beneath the surface of the island. The protection, maintenance and long-term sustainability of the aquifers are vital concerns of the NSWCA. The following are some basic facts and answers to frequently asked questions that the NSWCA receives. 1. What Is Hydrogeology? This is a branch of the earth sciences in the area of geology that deals with the distribution and movement of groundwater. 2. What is an aquifer? Essentially, an aquifer is an underground geologic formation, typically composed of permeable rock and/or unconsolidated gravel, sand, pebbles or silt. Aquifers contain, transmit and yield water in usable quantities. The aquifer formations beneath Long Island were deposited at different times in the island’s geologic history. Also related are Aquitards and Aquicludes. Acquitards are clay units that have very low permeability, minimizing water exchange between the layers of an aquifer. Aquicludes (or aquifuges) are solid impermeable areas that overlay an aquifer. Layers of clay between certain aquifer layers retard some water movement beneath Long Island. The aquifers slope toward the southern part of the island. This causes the deepest parts of the aquifers and the groundwater system to reside along the southern shore of Long Island, and to extend out into the subsurface material beneath the Atlantic ocean floor. 3. The Three Major Long Island Aquifers: Nassau and Suffolk counties obtain their drinking water from three major aquifers underlying Long Island which constitute a sole source aquifer. The aquifers are, from the shallowest to the deepest, the Upper Glacial, the Magothy and the Lloyd aquifers. One minor aquifer, the Jameco is also in use. A. The Upper Glacial Aquifer: Formed during the last ice age, the Upper Glacial is the aquifer closest to the surface. The youngest aquifer formation, the Upper Glacial, was laid down during the last Ice Age, 10-15 million years ago. It contains sands, pebbles, rocks and occasionally boulders, carried to Long Island and left behind by the glaciers. The water table, meaning the top of the groundwater system, is found in the Upper Glacial aquifer. B. The Magothy Aquifer: The largest of Long Island’s aquifers. Consisting of sand deposits alternating with clay, it attains a maximum thickness of approximately 1,100 feet and is the source of water for most of Nassau County and about half of Suffolk County. The formation can be seen in the coastal bluffs of the north shore and plunges under the land surface to the south. The sand and gravel of the Magothy aquifer was deposited in the upper Cretaceous Period, about 50-80 million years ago. The Magothy aquifer supplies more than 90% of the water used in Nassau County and about 50% of the water used in Suffolk County. A sand and gravel formation ranging in thickness up to 500 feet thick, the deposits were laid down in the Cretaceous Period, about 80-100 million years ago. The Lloyd aquifer is 1,800 feet below the surface at its deepest point and the water it contains is about six thousand years old. The Lloyd aquifer is found at depths averaging 200-300 feet along the north shore. Along the south shoreline the Lloyd aquifer is approximately 1,500 feet below the land surface. New York Environmental Conservation Law §15-1528 established a moratorium on the use of water from this formation to maintain it for future generations. 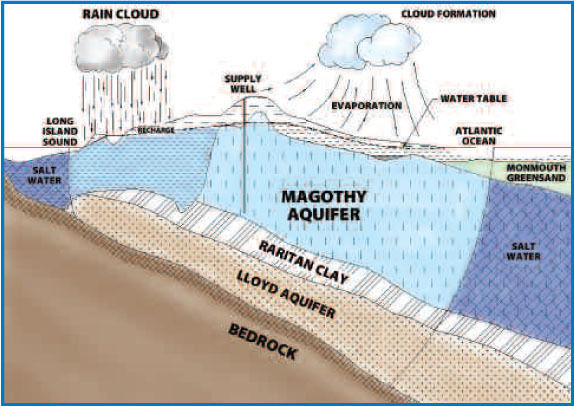 In addition to the aquifers, the Raritan Formation, a clay deposit averaging 100-200 foot thickness, separates and confines the Magothy and Lloyd aquifers. It has two primary units: An upper clay member and a lower sand member called the Lloyd Sand. The clay member reaches a maximum thickness of 300 feet. 4. Our Groundwater Reliance: Nassau and Suffolk counties utilize a sole source aquifer. Long Island is not alone in having groundwater as a source of drinking water. Across the USA, some 100 million Americans utilize groundwater for their drinking water. 5. Recharging Our Aquifers: Our aquifers are among the USA’s most prolific, containing an estimated 90 trillion gallons of fresh water. All Long Island aquifers receive their fresh water from precipitation, averaging some 44 inches of precipitation per annum. Surface water from precipitation and snowmelt serves to continually recharge/replenish Long Island’s aquifers. Surface water progresses through hundreds of feet of closely packed sand, gravel, pebbles and soil, and is filtered of most impurities before reaching the aquifers. Precipitation and snowmelt replenish more water than is pumped out annually, but without meticulous day-to-day oversight and management, that could change.